After a superb first half, and a very good overall display, Jack Wilshere got another 90 minutes under his belt for Arsenal, and showed some real moments of quality throughout. The midfielder stood out during the 4-2 win over BATE Borisov, grabbing an assist for Theo Walcott, and now that he’s building up his match fitness should start knocking on the door for Premier League games too. We all know Arsene Wenger is a huge fan of his talent, but has said his future depends on his fitness – and the Arsenal manager says he’s praying Jack can stay fit. “He had an outstanding first half and he did fight until the end,” said Wenger. “I think he is on a good way back to his best. He has shown that tonight. He is at an age where a player normally gets to the best of his career,” he said. He is on the way up and he has only been stopped by a series of injuries. “Hopefully, I just pray that he is not hampered anymore by any problems and then we will see him getting stronger and stronger. It’d be good to see him stay fit, because if he does he can add something to this team, particularly in the continued absence of Santi Cazorla. How did Wilshere rate? See our player ratings here, and leave your own ratings. He just jinxed it didn’t he? It would help if he gets more clever and anticipated the physical way of playing football in England. Initially I thought lunjgberg magically appeared and playing for us once again. Jack played like Freddie last night. Less weight on his legs eh?? Good to see Jack back. He’ll be a very important player for us if Wenger manages him well and doesn’t do what he did with Santi. It’d be great to see him link up with Mesut, Alexis and Ramsey. I’d love to see him in a 4-3-3. What did he do with Santi? Expect a professional footballer to play? Yeah it’s poor football management when a surgical problem keeps a player out of the game. Good thinking, I never put those two together. Santi aggravated his achilles injury against Ludogerets. Stop lying. The doctors part being important. So you think that Wenger just ignored medical advice, the wishes of the player, and everything else just to put him on? Especially in Ludogerets? That was a game to help him regain fitness if anything–turned out he wasn’t fit. What is going on man, why are you so vested in your idea here? It just simply isn’t true that Cazorla was mismanaged. Nobody is even saying it. Don’t tell them that. It was very logical to overplay a 31 year old player with recurring achilles problem in a meaningless game when we had Xhaka on the bench. He stupidly overused a player with a recurring achilles problem. Santi did not need to play against Ludogerets. Then again, “positive fans” and Wenger fanboys like you never see logic. Oh no, Wenger is going to shoehorn him into the side isn’t he. Both him and Ozil are liabilities for this reason, and I’d prefer them both to be injured. How you can prefer our players to be injured with a fixture list ,the kind we have is beyond me. And if they are injured, I trust you to blame Wenger for having injury prone players. 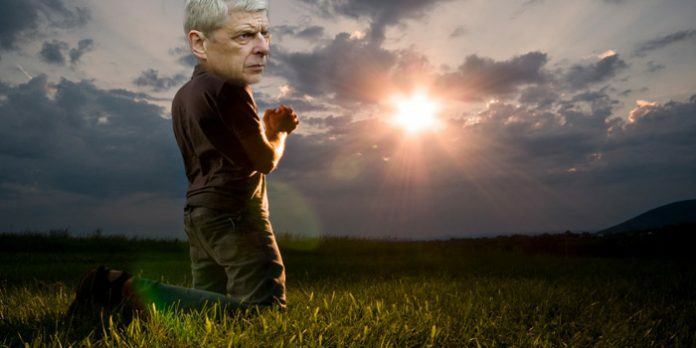 I didn’t particularly think of Wenger as a praying man. A quick plea for the intercession of Bergkamp never does any harm. He’s changed. We saw him pray, most notably, clutching Pat Rice at the end of ’11-’12. But that makes me believe in him more. Anyone who believes they are in control of 100% of everything and are also equally responsible for 100% of everything is delusional and hubristic. I don’t think Wenger is without his faults, and I think everyone, including the man himself, is beginning to try to close out his career in some rationalization of the narrative of these past two decades. It will be a sad day, no matter how the results go, to lose the truly genuine, most interesting man in football. Wasn’t Jack on his way out to West Ham? He still holds the ball at his feet too long. He invites the tackles. If Jack could change that aspect of his game, I feel he can really string together a good run of games and compete for a first team starting spot. He did look brilliant in the first half! They may have beaten Bate but until Wenger can prove himself against the big teams,I will reserve judgement. Btw,Ancelotti has just just been sacked. Nothing surprises in the fw except how the fm can escape the axe so long. You’re reading the wrong articles and following the wrong team. This is Arsenal. This is the way we do things. We respect players as people not assets. We run a football club with the future in mind. We seek to create beauty and beauty doesn’t always win. I’ve followed his club my whole adult life. I accept it with all its frustrations and love it more because we have a certain way of doing things. Some people say we’re behind the times. Yes maybe. But I’d challenge you. Go follow another club this closely for a few years. You’ll find warts and find yourself as disillusioned. Name a club that isn’t frustrating to follow. Bayern? United? Barcelona? PSG? Jive? Every one looks rosy from the outside but has major warts. I won’t say Real because I admire them at the moment, mostly due to Zidane and some of the young talent their allowing to come through the ranks. …a little scope creep in my comment but I think you get the point. Well said. I don’t think I could still be so passionate about supporting Arsenal if we sold out like most other top teams. We have a billionaire owner, but thank fu** he doesn’t get involved in sporting matters. Nights like last night, seeing Arsenal lads get a run out, is what football is about. When is the last time Chelski gave a youngster a real chance in their first team? Most teams are killing the careers of so many aspiring and talented youth players now. Huge respect to Arsenal for sticking with a long term plan despite the huge temptation to sell out for short term success. The sport has turned into an ugly business – luckily for us Arsenal Football Club still appreciate it as a sport. Best of luck to him. Jack was outstanding. He’d have bagged a goal too if Theo wasn’t Theo and actually passed. Thoroughly enjoyable game as well. Makes a nice difference than watching us play Dortmund or Olympiakos. I’ve really enjoyed both games so far and hope the youngsters get a game in every group game at least. Thumbs up for your second sentence. This is much more enjoyable than the tedium of another CL group stage (and if you see it as a means to an end, the end is losing to a good team in the round of sixteen). Yeah that was a terrible decision by Theo. He had a good game though overall. Looked sharp for both goals. Jack played well but I don’t think he’s a Pirlo type midfielder he thinks he is. He’s runs forward, his passing around the last third and his link up play is brilliant. I think he is ready for a first team call up and would be very useful against teams that sit back. Wenger is pushing Özil out of the club for his leaving in january to make way for Jack, so yes, he can pray Wilshere can become good. Btw, the latest games show we don’t need Cazorla. His control/first touch was amazing. Passing and vision as well. I had forgotten what he really brings to the team. He was on the bench for PL last week, and I hope that continues because he brings a whole lot that we need to the table. Could break into the first team if he keeps this up. God, I’ve missed him. Can’t imagine what I’ll feel when Santi gets back now. I really haven’t felt for any other player since Dennis retired or perhaps since Bobby left that he is a completely and ultimately Arsenal. Wilshere at another club, for me, is a real shame. His game, his quality and his attitude – its everything I want to see in a player. When he is off the pitch it is easy to say that he should go. It is logical. But on the pitch, it is indisputable to me that we should give him every chance so long as he stays professional and gives his all to get there. Really, really like Jack as a player. Link-up play with Giroud is just excellent. Ramsey, though I get more frustrated with him, has great link-up play with Giroud too. As excited as I am about Lacazette, I really, really love that we have this Plan B on the cards. That Giroud-Wilshere link-up against Norwich. That Giroud-Ramsey link-up against Hull in the FA Cup Final. Arsenal pure and simple. I really hope Wilshere finds his way back. Wenger a year or so ago said “if there was any justice in the world” he’d make it. I feel the same too. Just great watching him. Wilshire is the real deal. He plays the beautiful game effortlessly.